The Saltbones was once fertile land surrounding a lake but fearsome battle magics shrivelled the land into a pale wasteland with nothing but salt and dead. The sudden deaths of the hosts on the field meant a number of unquiet dead. Those necromancers who need not worry about things like water or food can find a host of minions, from salt-crusted skeletons to rime wights. Those bothered by such gain a racking bloody cough until they know how to survive in such a place and the undead rarely allow rest. Those dying in the Saltbones find death is not the end that philosophers claim. The nearest community is Avahana, a town of just over a thousand souls. The buildings are red sandstone houses built around sheltered courtyards. Their salt-crusted foundations blend with the salty topsoil, making them seem ghostly from a distance. The houses are well-built, almost fortified against attackers and the central courtyards house lush gardens planted in raised wooden beds above the salty soil. The locals are reserved yet compassionate, their faith in the gods of life and the sun tried and tested by the Saltbones. It is a grave offence to abandon someone or fail to make sure they are safe. The community is strong enough that if one house suffers misfortune, neighbours lend whatever aid they can. Beds of cactus are planted around the town to provide defensive brakes against the undead. Avahana is shaped like a figure eight, the eastern circle closest to the Saltbones has a temple at the centre, the temple is well-appointed yet works hard to protect the community. Outsiders wishing to buy holy materials pay a premium rate (25% above the normal) and must prove themselves worthy customers. The notable exception is if healing is required after a battle with undead from the Saltbones. This is provided for half of the usual price and if the petitioner is a local or helps protect a local, payment is usually waived. Where the two circles intersect is the wealthiest part of town where the most valued houses are. There is no tavern, visitors to Avahana are invited into a house by the locals and treated as family. A salt bond operates, once the guest has tasted salt, neither they or the host may harm the other. The west has a bustling marketplace where ingots of pure salt are traded with merchants in return for wares that cannot be purchased there. At the heart of the marketplace is a fortified smithy owned by a taciturn smith said to use magic in his work. His ability to craft dull grey steel that does not rust and access to alchemical goods and useful minor items are held in awe. As a result, his services are not cheap yet his forge is often active late into the night and his apprentices are wealthy in their own right. Both centres work together to keep the status quo intact, for Avahana grows, launching forays into the Saltbones raised to purge the undead and to scout possible locations to mine salt from the former lake bed. There salt of exceptional purity is found. 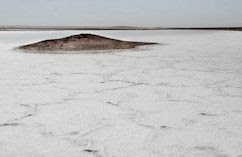 This salt is hard-won, the presence of digging traces attract undead and on the salt flats there are few places to hide.